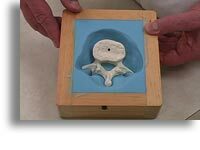 Welcome to Freeman's video library, featuring over three hours of instructional and product videos, making it the most comprehensive free resource for the making of parts, patterns, tools and molds. More videos are currently in production. The only way to access all of the videos in this library and be notified of new releases is to join our newsletter. Sign up here. 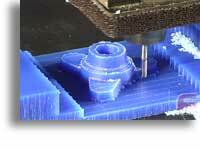 We briefly demonstrate how master models are created, with special attention paid to CNC machining, from CAD software to the finishing machining pass. 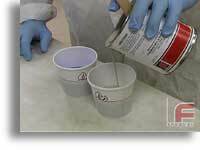 We demonstrate proper procedures for sealing your model or mold and then applying release agents to allow for easy and clean part release. 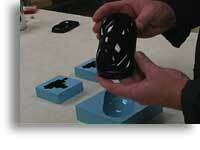 We explain how to calculate your material requirements for a job. 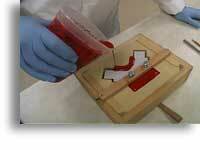 Then we demonstrate proper agitating, weighing, and mixing procedures. 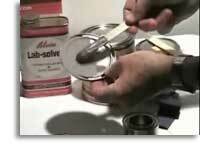 Both 1:1 ratio and uneven ratio materials are covered. 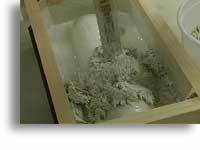 We demonstrate the use of vacuum degassing equipment and pressure pots in order to achieve virtually perfect, void-free castings. 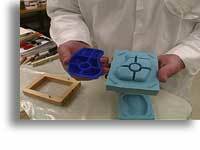 Ideal for smaller models/molds with a flat side, fast-cast urethanes are widely used for their ease of use, low cost, and quick demold times. However, their use requires careful application of release agents. 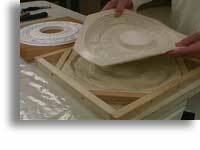 Ideal for smaller projects (less than 12" x 12"), this is the easiest process for creating parts, patterns, tools, & molds. 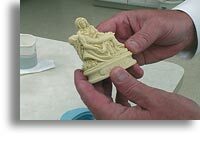 We demonstrate creating a silicone rubber mold and then the casting of parts with Repro, epoxy casting resins and polyurethane elastomers. 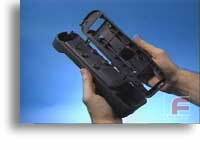 Casting thin-walled parts follows a similar process to the mass casting video above. 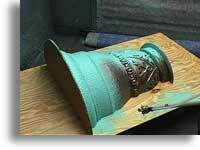 However, this project requires important differences in venting, gating, and the use of pressure. This video is only available on our compilation DVD and to newsletter subscribers. 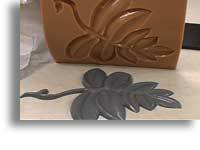 The more detailed your patterns, the more difficult it is to cast void-free molds and parts. 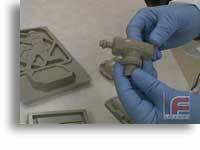 Here we show you a few tricks to get consistently better results when working with highly detailed castings. 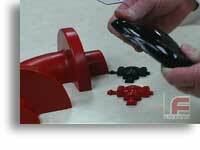 When a project requires a complex parting line, it is often easier to pour the entire mold in one process with clear rubber, then cut your parting line. 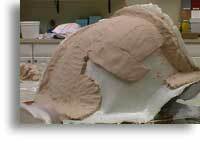 This process also saves at least a day in creating the mold. Sometimes making a straight parting line (or even a simple curved one) isn't practical. 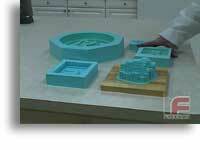 Therefore, one must be creative when forming the two halves of a silicone rubber mold. This process shows one method for creating complex parting lines. 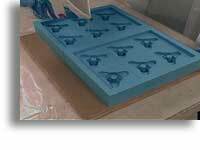 When a project requires numerous duplications, a multiple cavity mold is created, enabling many more duplications to be created in a set amount of time. 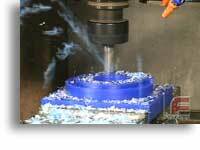 Ideal for working on medium-sized projects, this process of pouring a high quality material around a lower quality core creates a highly accurate, yet economical part. 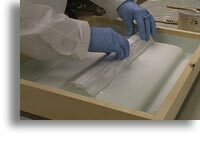 Ideal for working on larger projects, a typical 'fiberglass layup' is a popular process for those who need a large, strong, and lightweight tool. 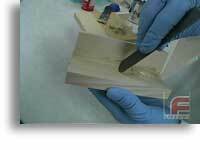 Here we apply the techniques from the video above plus some more advanced techniques to create a more complex epoxy fiberglass laminate tool. 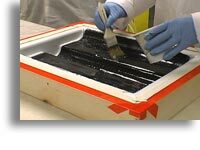 Using the fiberglass mold created above, we demonstrate the vacuum bagging process by forming a carbon fiber part. This process is for working on medium to large projects, this is a labor-saving process for those who need a large, strong tool in the least amount of time possible. 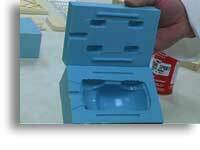 This video also demonstrates three-part mold construction. 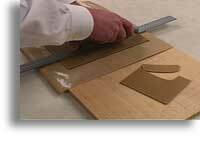 Ideal for working on medium-sized projects, this process is easier, faster, and more economical than the epoxy laminating system. Ideal for working on medium and large projects, this process involves creating a thin layer of flexible material and backing it up with a stronger, rigid material. 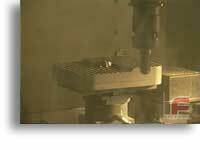 Our own industry-standard, fast-setting, low cost, filled urethane systems for foundry tooling, molds, prototypes, and models. From Freeman's greatly expanded FMSC lines of economical urethanes to Huntman's premium lines of Ren Parts-In-Minutes and RenCast polyurethanes, Freeman carries the best selection of quality urethanes for any project. 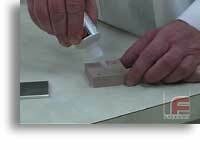 Covering Bluestar's high-quality lines of silicone systems for rapid prototype tooling, polyurethane casting, general plastic tooling and silicone mold-making, this video also includes exclusive demonstrations of cure inhibition, perhaps the least understood characteristic of addition cure and condensation cure silicone rubber. Our own very hard machining wax designed for proofing CNC programs, plus constructing self-releasing models, prototypes and master patterns. 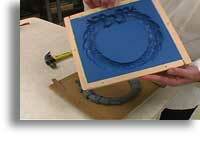 Freeman Sheet Wax is used primarily to simulate metal or part thickness when making metal forming dies or punches, resin transfer molds (RTM), or any two part molds where a uniform part thickness is desired. 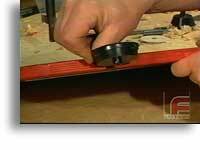 From modeling, styling and low-density foam board to foundry boards, fixtures, prototype metal-forming and even injection-molding RenShape is the most complete line of urethane and epoxy tooling boards. This video also introduces seamless modeling paste, a complement to the RenShape line for economical retooling and very large tooling projects. 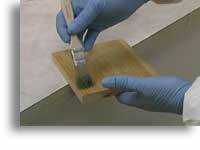 Perfect Plank is a laminated pattern lumber, patented and manufactured for the pattern, mold and model industries. 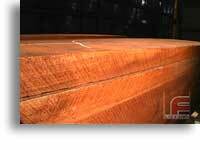 With the scarcity of high quality rough lumber, Perfect Plank is a popular alternative for making wood patterns. 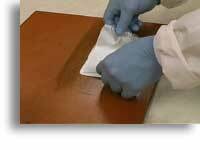 Our extensive line of polyester repair and build-up materials, including Quik-Fil, a unique material designed for the repair of urethane modeling boards. From Freeman F-Bond line of one-component cyanoacrylate adhesives and accessories to the Araldite lines of urethane, epoxy, and methacrylate adhesives, this is the most complete offering of adhesives for the modern toolmaker. Featuring Bluestar VRM-65 thixotropic silicone rubber and a modified Michael Engineering RamFlow dispensing machine, this video shows a unique spray system that allows for rapid, even application of silicone on larger models. 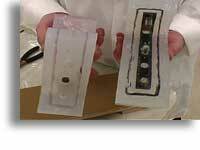 The following videos have been produced by the respective manufacturers. We've converted them for online viewing as a service to our visitors. All rights are reserved by the original owners or producers. 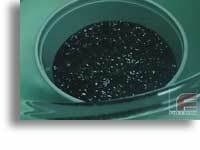 Produced by the manufacturer, Alvin Products, this provides a simple introduction to the metal filler system. 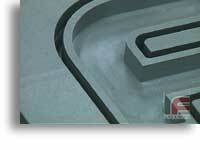 Produced by the RenShape Solutions division of Huntman Advanced Materials.